SaltStack sponsors the Southern California Linux Expo with talks and demonstrations highlighting event-driven infrastructure automation. Don’t miss these Salty talks from Christer Edwards, Adobe senior systems administrator, and David Boucha, SaltStack software engineer, highlighting SaltStack for data-driven orchestration. SaltStack®, the creators of data-driven orchestration software for the management of any infrastructure or application stack at scale, today announced it is a sponsor of the Southern California Linux Expo for the fifth year in a row. SaltStack will demonstrate the power of data-driven orchestration for event-driven infrastructure through talks and demonstrations delivered by speakers from Adobe and SaltStack. Also, SaltStack can be found in the expo hall in booth #117. 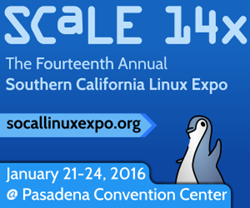 SCALE 14x will be held this year in Pasadena, Calif., Jan. 21-24, 2016. Christer’s talk titled, “Ops Tools for Infrastructure Hardening,” will highlight how Adobe Systems is leveraging SaltStack for full system auditing, reporting and compliance. His presentation outlines how Adobe automates infrastructure hardening for FedRamp compliance and highlights the custom tools and modules we've created for SOC-2 and beyond. The initiative also includes components for HIDS, FIM and CIS compliance auditing with extensions that include osquery integration for SQL-like querying capabilities across the entire Adobe data center. Dave’s talk titled, “Beyond Configuration Management with SaltStack for Event-Driven Infrastructure,” will show how SaltStack is so much more than just a configuration management tool. Specifically, Dave will outline and demonstrate SaltStack intelligent, data-driven orchestration for event-driven infrastructure automation. SaltStack is built to help optimize the entire infrastructure and application stack via dynamic adjustment of resources based on monitored data, changes and events. Dave will provide an overview and demonstration of SaltStack Beacons combined with the SaltStack Reactor for proactive and autonomic system monitoring and management. Read the SCALE 14x speaker interview with Dave to learn that Dave expects presentation attendees to bring and use cell phones during his talk and encourages group participation during his demonstration of SaltStack data-driven orchestration. Register for SCALE 14x now using promo code “SALT” to receive 40% off the registration price. The 3rd annual SaltStack user conference is coming back to Salt Lake City, April 19-21, 2016. Attend to hear how organizations like Adobe, Aetna, Dun & Bradstreet, Dutch Government Data Centers, Lyft, Pure Storage, National Instruments, TD Bank, the U.S. Department of Agriculture and many more are using SaltStack to orchestrate and automate any infrastructure or application stack at scale. SaltConf16 is the most effective and economical way to get Salted but the best discounts are available for a limited time only. Register now. SaltStack recently announced new SaltStack Support offerings to provide Salt Open users and SaltStack Enterprise customers with dedicated, prioritized access to the Salt brain trust for any Salt implementation. Customers that subscribe to a SaltStack Support package by Friday, Jan. 29, 2016 receive complimentary SaltConf16 passes.